Does God Play Dice with the Universe? The most widely used insecticides in the world—neonicotinoids—turn bumblebees into more bumbling pollinators, leading to lower yields for apples and perhaps other plants that they visit. That’s the message from a new study by Dara Stanley at the Royal Holloway University in London, the first to show that neonicotinoids affect the plants that rely on bees, as well as the insects themselves. It’s the latest in a damning and growing body of evidence about the negative consequences of these chemicals. Bees and other pollinators help to fertilize around seven in eight species of flowering plants, including many crops. They play invaluable roles in nature, and their contributions to human agriculture are enormous. “One in three bites of food we eat comes from crops pollinated by bees,” says Stanley. But “pollination services,” as they are often called, might be suffering because of neonicotinoids. These chemicals are systemic pesticides: Rather than just sitting on the surface of plants, they are absorbed and transported to all kinds of tissues, including nectar and pollen. That’s where bees and other pollinators can encounter them. And even if the neonicotinoids aren’t present at anywhere near a lethal dose, they can still affect insect behavior. They impair a bee’s memory and its ability to navigate, reducing the foraging skills of workers, and creating a vicious cycle that hobbles the colony’s workforce. Ineffective workers means a shortfall of food, which means that workers are sent on more foraging trips at the expense of caring for youngsters, which means that the colony produces fewer new workers, which means even less food, and so on. This slows the growth of existing colonies and, by reducing the production of queens, prevents the creation of new ones. “Much of this previous work looked at things from the bees’ perspectives,” says Stanley. But she wanted to know if the plants are also affected. For two weeks, her team fed bumblebees on nectar spiked with extremely low levels of a common neonicotinoid called thiamethoxam. They then released the bees in outdoor cages containing virgin apple trees, which had never been visited by pollinators before. 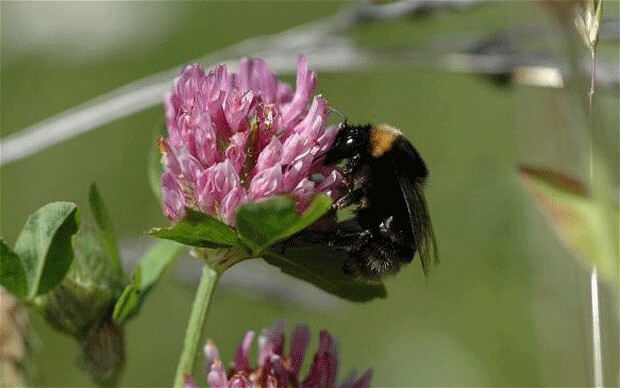 The team found that bees that drank from the spiked nectar actually spent more time foraging, and visited more flowers. That ought to make them better pollinators, but not in this case. They didn’t succeed in collecting any more pollen and the flowers they visited didn’t produce more apples. Perhaps they were behaving differently on the actual flowers, or failing to learn from experience as bees normally can. Either way, the neonicotinoid-sipping bees became busier, but no more effective. And even though each individual was more active, the insecticide-treated colonies deployed fewer foragers in total. As a result, the apple trees received fewer visits and produced fruit with 36 percent fewer seeds—a sign of poorer quality. Apples aren’t just pollinated by bumblebees, but by many species of solitary bees that seem to be even more sensitive to neonicotinoids. It’s possible, then, that Stanley’s results underestimate the costs that these insecticides exert upon apple orchards, especially since one study estimated that poor pollination already costs U.K. apple growers around £5.7 million a year.